History and Accomplishments of Island Expedition and the School at Sea. 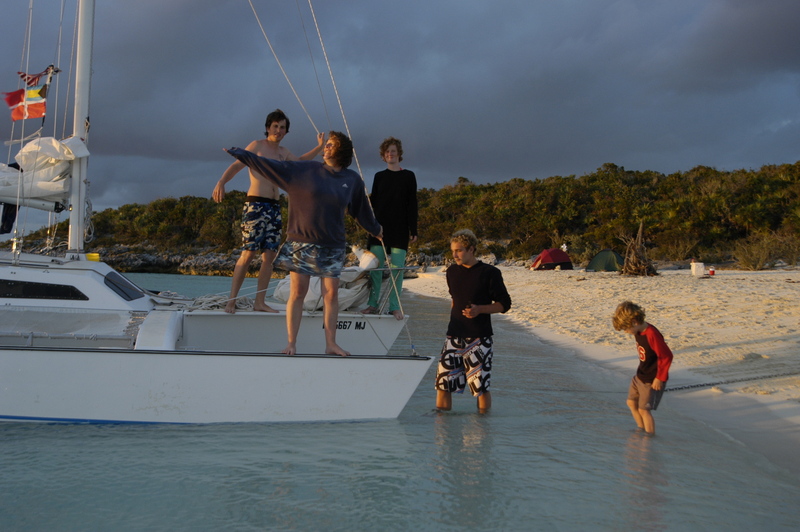 - 1985- Dragan Popov (Stanford University -Anthropologist) and brother Nicolas Popov (University of California Santa Cruz –Marine Biologist/Photographer) return to their Bahamas home to form an organisation called The Bahama Family Island Expedition. In only 2 months with research permits approved and grants from Stanford University and Shell Bahamas the first expedition set off on a 15 foot inflatable named “Zora” with 35 hp outboard to the Northern Bahamas. 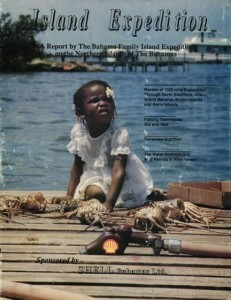 The main objective of The Bahama Family Island Expedition was to document the culture and environment of the whole Bahamas and on this first expedition all communities in the Northern Bahamas were visited on a continuous expedition from July to October 1985. A strong emphasis in the ethnographic expedition was also to study the new and old fishing methods. Photo- Love Beach, Nassau- Expedition members from right N. Popov, Danah Quimby and Phil Dutton preparing hard bottom inflatable for 4 months expedition to the Bahamas Outer islands called the Family Islands. 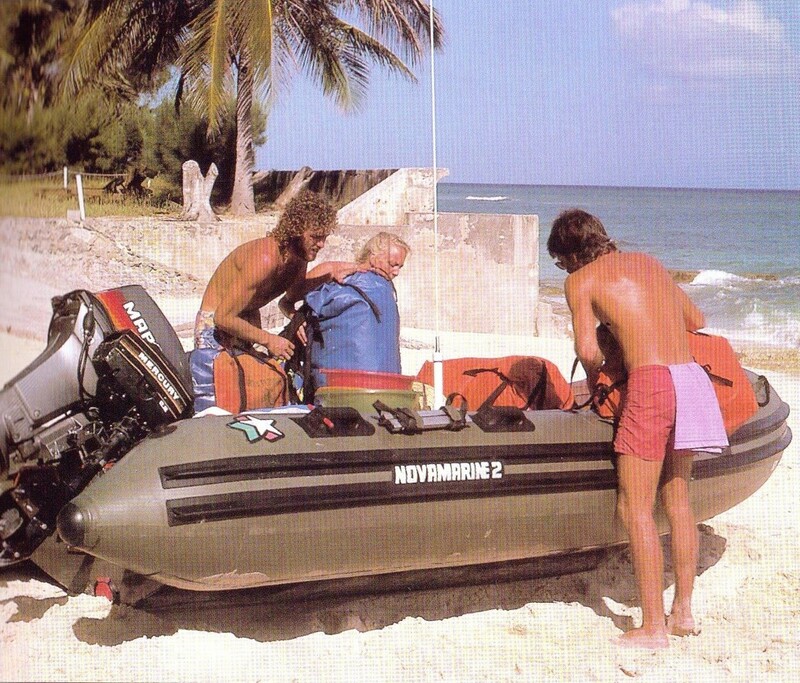 -1986- Five months expedition of the Central and Southern Islands of The Bahamas in 2 Novamarine 15 foot inflatable with 40hp outboard engines. Team members Danah Quimby, Phil Dutton and Pascale Chaltelain continue to help as volunteers in and off the field. 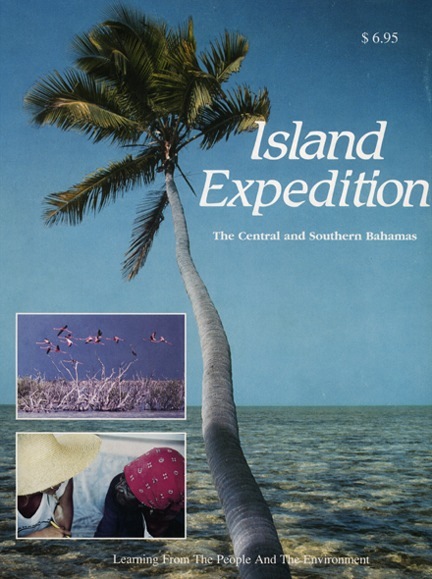 -First Publication entitled Island Expedition- The Northern Bahamas is published and distributed to all the schools in the Bahamas (see cover below). -Numerous presentations to schools in The Bahamas and Universities in the USA (Miami, Stanford, UKSC, Columbia) are made. The Bahama Family Island Expedition is invited to the Miami boat show and attends boat show for 4 consecutive years. -Weekly articles are published in the local papers of Nassau, Bahamas and in monthly publications and scientific journals in Europe and America. 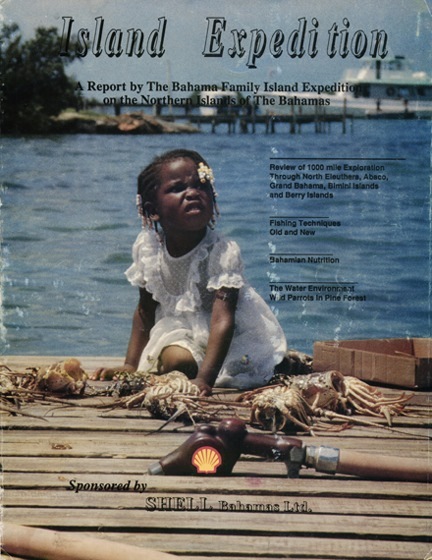 -1987- The Organisation is now called Island Expedition and registered as a non-profit and non- governmental organisation with aims of helping to safeguard the culture and environment of The Bahamas. -Expeditions are conducted to the largest Bahamian island of Andros and to the southern most one of Great Inagua to study the isolated populations of wild flamingos. -Documentaries of annual traditional sailing regattas, in Great Exuma, Staniel Cay, North Eleuthera, Andros and the Abacos are released in daily local news papers and international papers such as the New York Times. The first of ten consecutive years of cover stories on Island Expedition’s work in The Bahamas is released in Southern Boating Magazine. 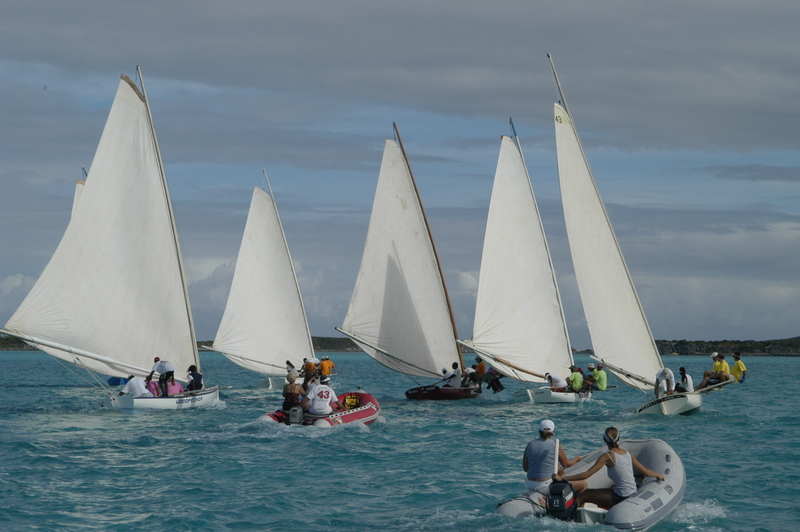 Photo- The Staniel Cay Regatta. 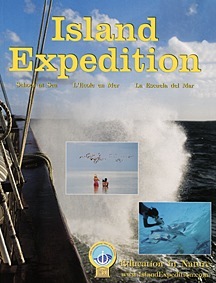 Island Expedition documented the annual New Years Day regatta for 20 consecutive years with articles published worldwide. 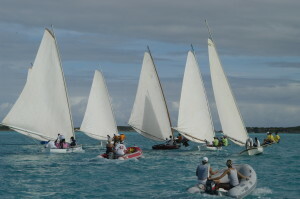 The national winning A class sloops Tida Wave and Lady M were build in the small island community of Staniel Cay with a population of less than 100 residents. Second book Publication of Island Expedition- The Central and Southern Bahamas is published and distributed worldwide (see book cover below). 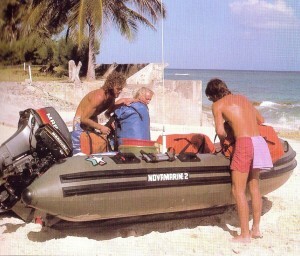 1988- Mapping of Bimini underwater sites with world famous photographer Dimitri Rebikoff and his Pegasus wet submarine. -Survey of the Bimini Mangroves is included in the project and a report is made to Bahamas government on the need for long term protection of this extensive mangrove system. -Special expedition to very remote Little Inagua with the aim of accessing the natural solution holes where a host of indigenous plants, including the endemic Royal Palm which grow to 70 feet or more, co-exist. -Expedition to the Ragged Islands and to southern Long Island to document the mass aggregations of Nassau groupers on full and new moons between November and January. IE goes on to study various reproduction sites of the Nassau Grouper and the effects of over-efficient fishing methods (diving with compressors and spears) vs the traditional trap and line fishing. 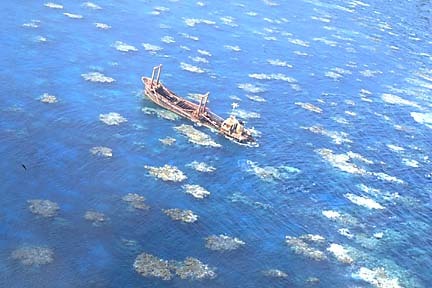 Many years later through the efforts of BREEF and IE, The Fisheries Department establish closed season during this vital reproduction phase of this very important fish resource. -Ongoing work include making presentations to Schools, Universities and institutions in The Bahamas, France and the USA. -Regular release of articles in the local papers of Nassau, Bahamas and in monthly publications and scientific journals in France and USA. 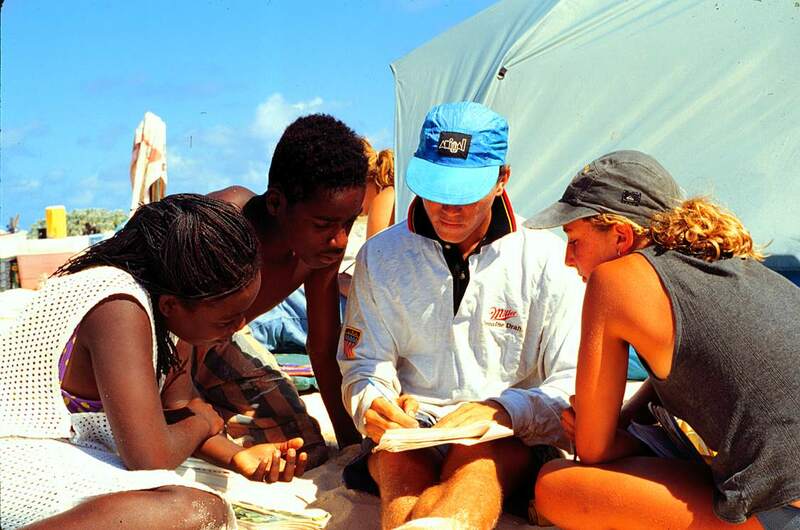 1989- A four months long ethnographic expedition of the Turks and Caicos Islands is undertaken in the same two Novamarine inflatable and all communities are visited in the archipelago. Teacher Jane Sydenham (Popov) joins the team of researchers during her summer teaching break. 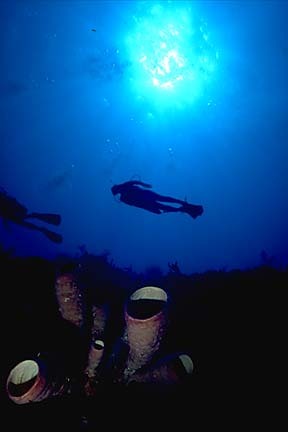 Photo- Tube sponges on the edge on Hogsty Reef unique drop off. -Smaller expeditions are made to: Hogsty Reef to study one of the only reef Atoll in the Atlantic Ocean , Little Inagua to continue explorations of the inland fresh water solution ponds and to the Dominican Republic for future expeditions to observe the humpback whales. 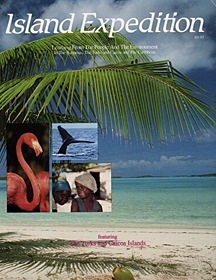 -Third book Publication of Island Expedition- Learning from the people and the Environment- Turks and Ciacos, Bahamas and Caribbean is published and distributed worldwide. 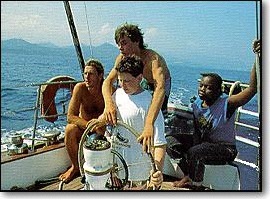 Photo- From left Dragan with students Cedryc Jordan (Belgium), Cyril Petracini (Italy/Sweden), and Kelia Mcintosh (Bahamas) on an internship in Corsica, France. 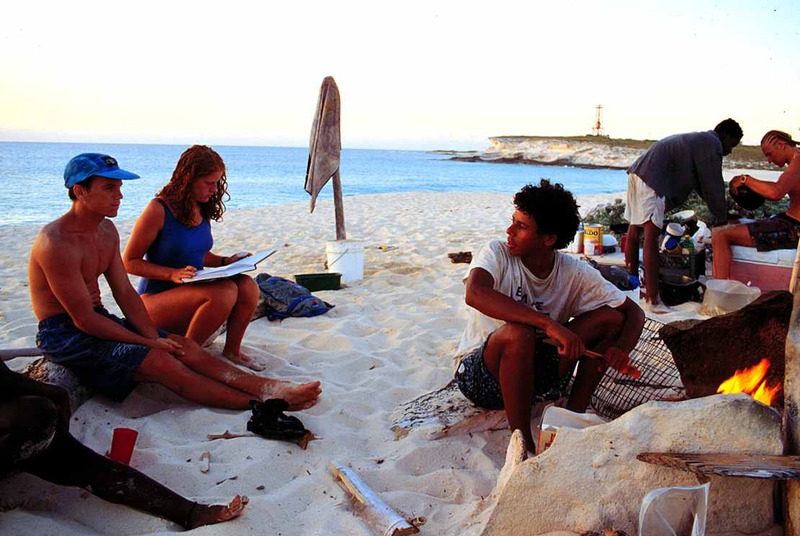 -The emphasis of the ongoing expeditions remain survival and adventure oriented with students and leaders camping on remote islands, catching their own food and cooking it on an open fire while researching and documenting the natural world above and below the ocean. Photo- Big Sand Cay. Turks and Caicos. From 1990 to 2000 Island Expedition used this small deserted island, 6 nautical miles south of Grand Turk, as a base for expeditions to the Mouchoir and Silver Banks for observation and study of the Humpack whales. - Expeditions back to the Turks and Caicos begin a 10 year study of the humpback whale in its wintering grounds of the Mouchoir and Silver Bank and in Samana Bay of the Dominican republic. Dragan and Nicolas Popov survey the wreck Polyxeni on the Silver bank to use as a base for observations of humpbacks and stay for 2 weeks on the wreck with team mate and underwater photographer Kevin Mulrine. -Survival show on ABC Good Morning America with Ron Reagan Junior, trained by Dragan Popov to survive on an island for 5 days with only water. -Ivana Popov, daughter of Nicolas and Jane Popov is born. 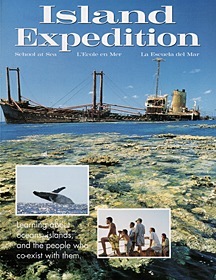 1991- Island Expedition and the School at Sea includes students from Europe and North America on its expeditions. -The release of “Les Enfants et la Mer” generates large media attention in Paris with articles published in many top French newspapers and magazines. 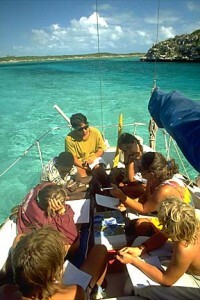 -Island Expedition is registered a non-profit research and educational organisation in France. 1992- Researchers with University and High School Students from many parts of the world took part on two semesters at sea Expeditions from January to June traveling from Nassau, Bahamas to the Silver Bank and back, a distance of over 1700 nautical miles onboard the “Simpatico” and “San Pedro” captained by Bertand Wache. The 2 original sturdy 15 foot inflatable were towed and used for marine research and setting up numerous camp sites. Several students spend a record 52 days observing humpback whales from the “Polyxeni” wreck on the Silver Bank. Photo- First foreign expedition student Adrian McCullough (1991) from Canada has a few glorious minutes underwater with the whale. - Polyxeni et les Baleines a film produced by Camel Adventure, Bonne Pioche Production and IE on 12 adventures living on the Polyxeni wreck observing humpback whales on the Silver Banks. May 1992. 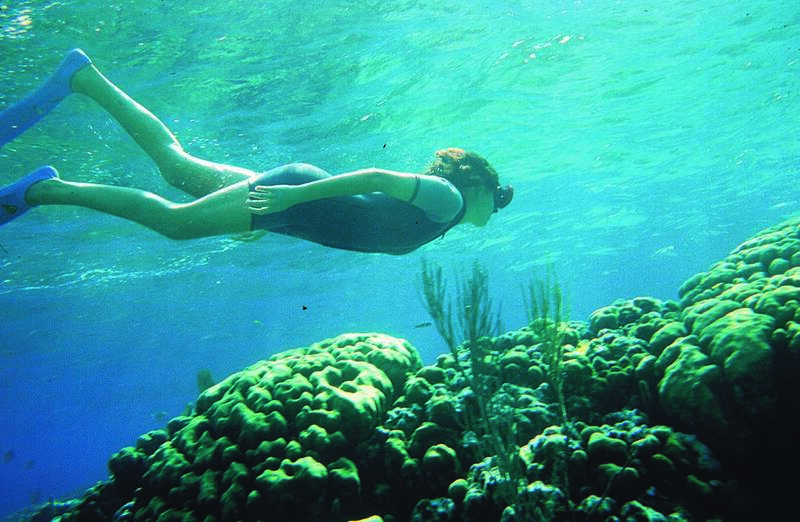 -Island Expedition produces The Bahamas- A Natural Beauty- a film documentary on the biodiversity of the Bahamas made for the Bahamas Government and presented at the Environment World Summit in Rio, Brazil in June 1992. 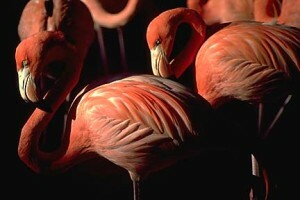 -Island Expedition exposes at the World Expo in Genoa Italy, August 1992. -Mikael Popov, son of Jane and Nicolas is born. Every year for the following 8 years IE organises two 3 months Expeditions traveling in the winter in the Southern Bahamas, Turks and Caicos, Silver Bank and Dominican Republic and in the Spring/Summer in the Central and Northern Bahamas. The main objective of each expedition was to allow participants to learn and study the marine ecosystems (coral, mangroves, seagrass, ocean) and to observe whales and dolphins. 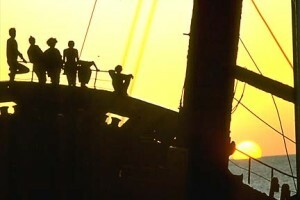 Also to continue documenting the traditional culture of island communities in the Caribbean. Each year a different group of students and volunteers from all corners of the world took part in the expeditions with leaders Dragan and Nicolas Popov and Jane Popov with children Ivana and Mikael joining on numerous trips. -During the schools summer and Christmas breaks, 1 to 2 weeks internships were organised in The Bahamas and France for students to be selected on future expeditions. 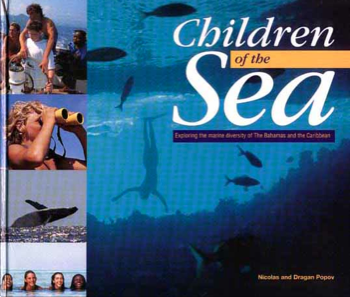 All high school level students who took part in these School at Sea expeditions followed their regular school work with home schooling programmes from their appropriate country. Adult volunteers joined the team to help supervise their work with a ration of 1 adult per 3-4 high school students. Many of the younger students were from financially restricted backgrounds and grants were obtain to fund their expeditions. Photo- Students Milan Rigot (Haiti), Dominic Smith (Bahamas) and Felicity Horsley (Australia) listening to adult University volunteer Jason Shepherd (Australia) on coastal management. -Every year the teams varied in size from 14- 20 participants on the longer 3 months expeditions. 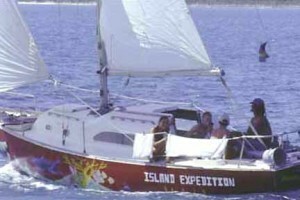 The IE sailing vessel Simpatico and its sturdy hard bottom inflatables were used on the expeditions along with several other larger sailing vessel who joined the expedition to help with the programme. These included the “Asperida” a flagship of the Earth Society Foundation and Sea cadet programme, the “Rose Bud”, a sponsored 45 foot Ovni sailing vessel of Jet Sea, ‘Bout Time captained by Mike Ferrara and the “Buridain” captained and owned by Henry Jean. 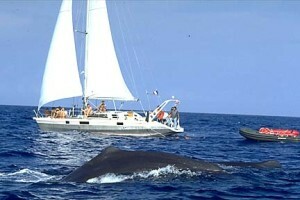 Photo- Expedition sailing vessel “Rosebud” following Sperm Whales in Mayguana passage. - Kidsquest- an interactive outdoors children TV show produced by Ghost writes and IE. 1994-1995. 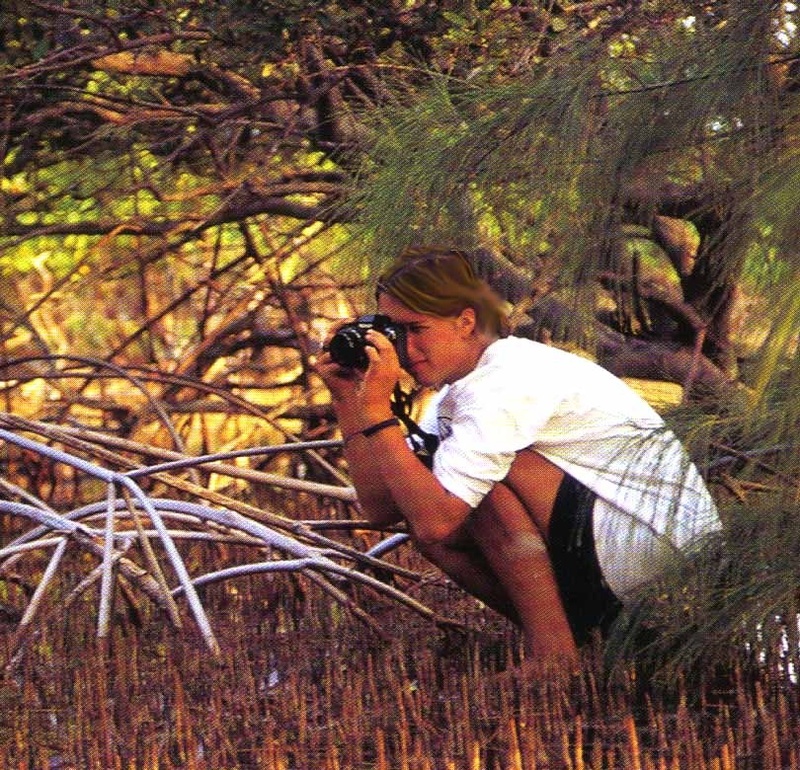 -Woman: This Wave one Ocean- Canadian film Documentary on worldwide adventurous women which included student Erin Lepine from the 1996 expedition. 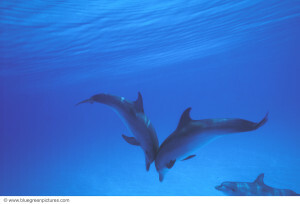 IE provided film footage to producers Point de Mire of Erin on a IE dolphin expedition. - Dragan Popov attends World Congress for Adventure in Australia and Chile and recruits students and volunteers from both countries to join the expeditions in 1996 and 1997. -Hommes et Dauphin- Segment of film documentary used from IE dolphin expeditions with Expedition member Eric Demay in conjunction with SOS Grand Bleu and interpreted by Jean Marc Barr (Grand Bleu). 1997. - IE book volume 5 “Education in Nature” published and distributed worldwide. 1997. (see cover below). - Through the UN’s Intergovernmental Oceanographic Commission (IOC) Island Expedition exhibits at the Universal Expo 98 in Lisbon, Portugal. 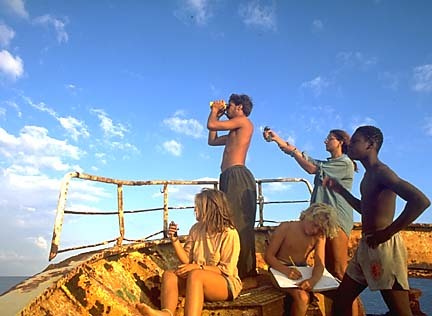 - Students observing humback whales on a shipwreck- Report on ten years of observations of humpback whales on the Silver Bank from a 300 foot shipwreck named Polyxeni. 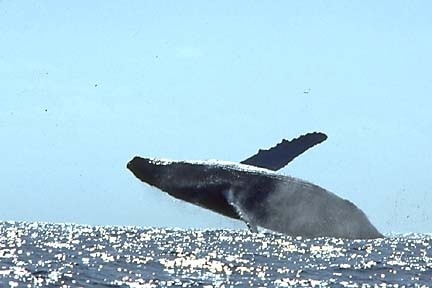 These studies were made each winter and much of the observations were conducted from the bow of the Polyxeni sitting 60 feet above the coral reefs and offering a bird’s eye view of the surrounding waters where the whales migrate each year to mate and give birth. 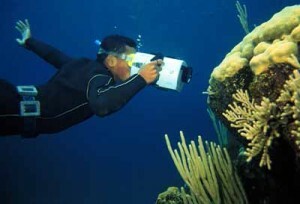 Further observations and studies were made on the inflatables and underwater. 1990-1999. The students include Calvin White, Carlos Farias, Zach Fentress, Petra Harvey, Alex Julius, Aubrey Parsley, Charlotte Ronveaux, Geo Seery, Whitney Berry and Elie Haswell with expedition leaders Dragan and Nicolas Popov. 2002 to Today. Internships and Charters. Nicolas Popov sets up base in the UK with Jane and their three children and the longer School at Sea Expeditions come to an end. Dragan and Nicolas continue to organise smaller expeditions of 1 to 3 weeks, specializing in dolphin charters in the Northern Bahamas (Bimini and White Sand Ridge) and trips to Eleuthera, Berry Islands and the Exuma Cays. Also in the spring and summer charters are organised on the Mediterranean, especially Sardinia, Corsica and Sicily. -Dragan continues to run internships from Nassau, Bahamas for Bahamian students, with special trips including students from Randfurly orphanage home and also physically disabled children. - Island Expedition and Taylor Productions Co-Production- “Harry and Steven Go to Sea” Explores the behaviour of two physically challenged Bahamian teenagers swimming with a friendly pod of wild dolphins. (55 minutes). Recipient of The 2004 Bahamas Film Festival documentary award. - Ongoing consultants for Caribbean and Island Governments on coastal and marine ecosystem protection and management and sustainable development in communities. 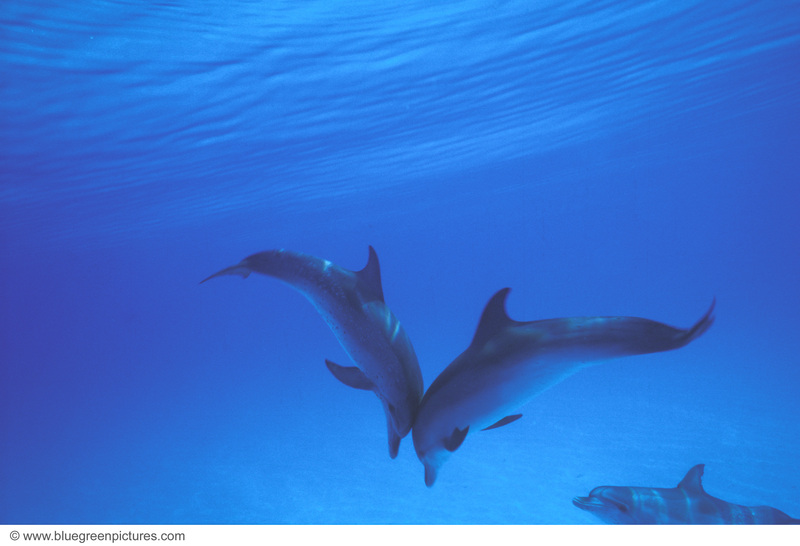 - Dolphin Charters and Expeditions- For over 25 years Island Expedition has observed the populations of Atlantic spotted dolphins and bottlenose dolphins found in the northern Little Bahama Bank and north of Bimini on the Great Bahama bank. The crystal clear water on these sparkling shallow white sand banks allow for very spectacular photographs and film and some incredible encounters between dolphin and man. 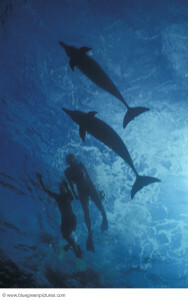 The interaction between wild dolphin and man which occurs in The Bahamas is unique in the world and therefore it is essential to use proper methods or etiquettes when swimming or observing the dolphins. 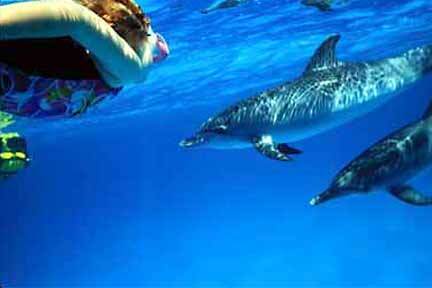 In other words there is no sure method of attracting wild dolphins and best to wait and let the dolphins come to you. Island Expedition and the School at Sea has engaged (to date) over 1000 students from 65 different countries in ocean and coastal expeditions covering over 100,000 nautical miles including two Atlantic crossings. 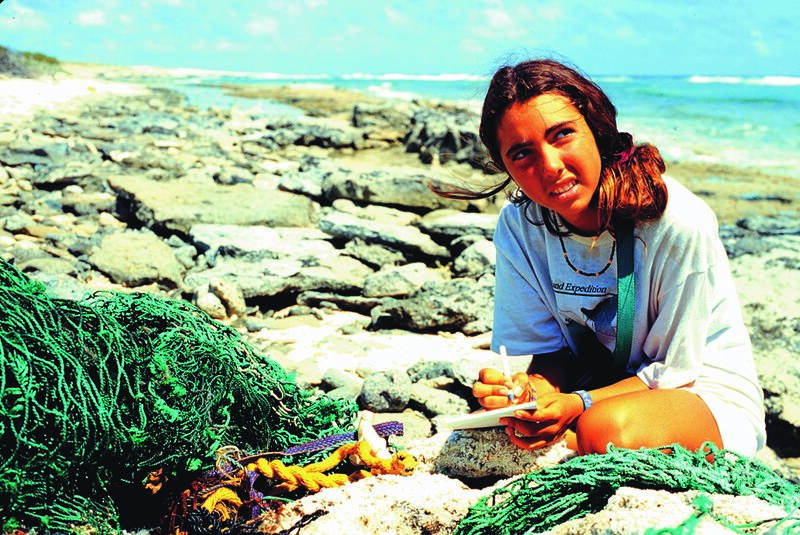 Many of these students are now involved in marine studies or environmental education.